As businesses continue to discover the blogosphere and the benefits and repercussions that come along with it, too many marketing managers are simply applying the principals and practices learned in Advertising 101 and/or sales training seminars to construct their blogging strategies. In other words, I have noticed several blogs on corporate Web sites that have been written in a manner similar to what one would find on a product description page. This is in fact a significant blunder in blog creation because it dilutes the true purpose of a blog; which is to organically engage with people in meaningful and purpose driven dialog. The fact is, consumers don’t read blogs because they’re interested in hearing a sales pitch, but rather they desire to scratch beneath the surface so as to discover the degree of actual value a product, service, or brand may provide to them personally. In actuality, there is no set formula or templated prescription for writing a successful blog other than to keep the content real and relevant for the reader. The content should be structured so as to capture the emotions of the reader/consumer and in a manner to solicit feedback. In many cases, this strategy goes beyond product-centric content and taps into the lifestyle of the audience; creating a customer-centric forum that harnesses emotions and develops a level of interest with significant impact for the reader. Truth be told, successful blogs really don’t require a major media blitz to create a following if they are constructed around relevant content, as mentioned above, and if they incorporate a technological infrastructure to support a loyal following. For instance, RSS integration is a tool that is designed to build traffic to a blog site while encouraging repeat visits through a syndication method that is non-intrusive. In other words, RSS doesn’t clog up email and it helps the audience discriminate relevant information from spam through keywords and descriptions. Cutting through all the complex definitions of blogging, the most direct description is that of an online forum for authors to post comments and/or questions so as to solicit feedback. For businesses, blogging should not be viewed as an extension of an advertising campaign, but rather a medium to connect with customers and stakeholders. Companies that utilize blogs effectively will discover that their audience is more than willing to provide constructive feedback, in some cases eliminating the need for focus group style market research. Additionally, blogs provide consumers with content they can search out for themselves, without having to rely solely on corporate-generated commentary. As a consumer, I appreciate the chance to view reader responses to corporate-generated content since it allows me the opportunity to experience the product/service from a peer’s perspective. For instance, if I’m preparing to make a purchasing decision, I as a consumer want to be well informed of the value that I would possibly receive from others that have bought before me. This is a great lead in for some common objections companies hold toward blogging. In my experience as a consultant, the two most common blogging objections that I run into include 1) the risk of negative feedback and 2) the lack of time. Starting with the negative feedback dilemma, companies must come to grips with the fact that not everyone can be overwhelmingly satisfied; and whether marketing managers like to hear it or not, the conversation about their company’s products and services is already taking place amongst consumers. Blogging simply provides an avenue for sellers to participate in the discussion. To overcome this first objection, any company of worth will have loyal customer evangelists who are willing to extol the company’s virtues and provide testimonials via an online forum if provided the opportunity to do so. For companies wondering how to accomplish this feat, the key is in identifying those customer evangelists and inviting them to participate in the online discussion. Although almost any company will have its share of detractors, it also has a large network of customers who will willingly go to bat for the company so as to defend it from critics. If a company is unable to identify any customer evangelists, that organization is in serious need of evaluating their customer service program because they probably won’t be doing business 5 years from now. To address the second objection, time is always a factor in business operations, one of the critical resources that is severely limited and often leads to the downfall of organizations that are unable to manage it wisely. However, blogging shouldn’t be viewed along the same lines as a company picnic or corporate birthday celebration, but as a critical component of customer relations. Without a doubt, blogging requires a significant commitment, however the burden of blog management can be mitigated through a smart and comprehensive strategy involving multi-blogger participation, strategic content parameters, and scheduled posting dates. In all, blogging is merely a tool that companies should leverage to envelop customers into brand loyalty and evangelism. If thought of as an extension of traditional advertising, the blog will ultimately fail because there will be a disconnect between the corporate message and the expectations of the reader. To succeed, keep the content real and customer-centric, and remember to implement technical mechanisms such as RSS or pass along links to broaden participation via social media channels such as Facebook, Twitter and Google+. YOUR FEEDBACK is appreciated, please reply to this blog with any questions or comments. As you may be aware from the myriad of past SEO posts we’ve made, the holy grail for getting more customers from Web searches is getting more backlinks (or linkbacks if you prefer). Specifically, multiple high quality link backs from other Websites in the same or related industry to yours. These are the “votes” Google uses to decide how high up on the search results page your site should be listed for a given keyword search. Google itself provides two incredibly powerful tools that have the potential to exponentially improve your return on blog writing time. Research current hot topics and searches on Google using Google Trends and Google Wonder Wheel. Find a keyword that fits within the realm of a hot topic, applies to your area of knowledge, and appeals to your target customers. Post a quality blog focused on the hot topic keywords for your target customers. Google Wonder Wheel Expand keyword options and refine a topic to find a keyword topic that fits you and your client base best. 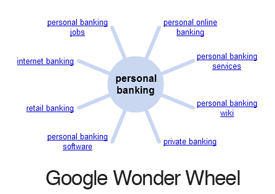 To utilize Google Wonder Wheel simply perform a Google search, then expand the “Search Tools” in the left hand column of the result page and click Wonder Wheel. If you use these tools I would love to hear about your experience.